I can hardly believe it, but Oscar is 20 months old! Honestly, the past five months since his last weigh in have flown by. I feel like we are in a good, stable place with Oscar these days. That doesn’t mean we don’t still have our challenges or that every day is easy, but I feel like I’m slowly figuring this pig parenting thing out. We are finally past the days of worrying about potty training or getting Oscar’s harness on which were some of our challenges in the past, and these days we worry more about keeping him stimulated with enough rooting time, finding his lost teeth in the house, and attempting to pick him up. Oscar is finally big enough that I simply cannot lift him. In retrospect, I think I was in denial that there would be a day when I couldn’t lift him. Although we’ve had to make some logistical adjustments with a ramp and figuring out how to get him from point A to point B when he is being stubborn, I don’t mind him being bigger. Sure, it’s more inconvenient at times, but there’s also more of him to cuddle! Our biggest challenge at the moment is that Oscar still head whips and sometimes attempts to bite when we touch his right side by his face. It’s something that he has done for a long time, and we have tried everything but haven’t figured out how to stop that behavior. He has also started charging at guests in just the past few months and I worry about that issue escalating with time, so we are working on that as well. I really am enjoying this time with Oscar now that he’s a little older. We seem to have figured each other out more, and we’ve settled into a better routine. I’m still surprised by how much more challenging the journey with Oscar has been than I originally expected, but I’m happy to be where we are with him. Here are some comparison shots with Oscar’s dog sister, Rylee. She is 17 pounds. Our little Oscar is still growing! 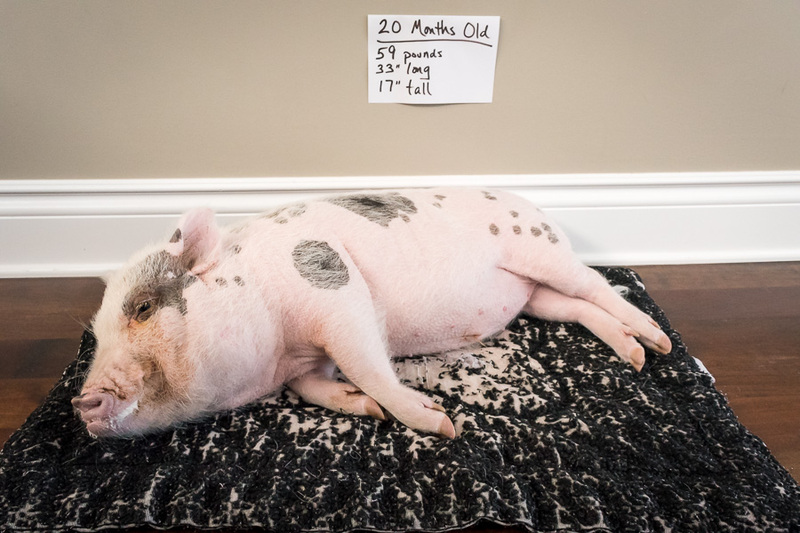 At 20 months old, Oscar is 59 pounds, 17″ tall, and 33″ long. Posing for pictures is exhausting! OMG, he’s gotten so many spots 🙂 He’s still not that big based on his weight. I haven’t been able to pick Elmer up in over a year. He’s around 100 lbs. now and he’ll be 3 in January. I think he’s done growing. Elmer doesn’t like the sides of his face touched much either. He allows me to sometimes, like when he’s calm and laying down. I’ve been trying to trim his hooves lately and he won’t let me. I did it a few times when he was little. They need trimming. I really don’t want to have him sedated. It worries me because I’ve read some pigs don’t come out of it and now that’s stuck in my head and I would be devastated if that happened. Does Oscar let you trim his hooves? Aren’t his spots funny? 🙂 He just finished blowing his coat, so you can really see his spots right now. Not sure why he’s blowing his coat in winter, but he looks so naked. 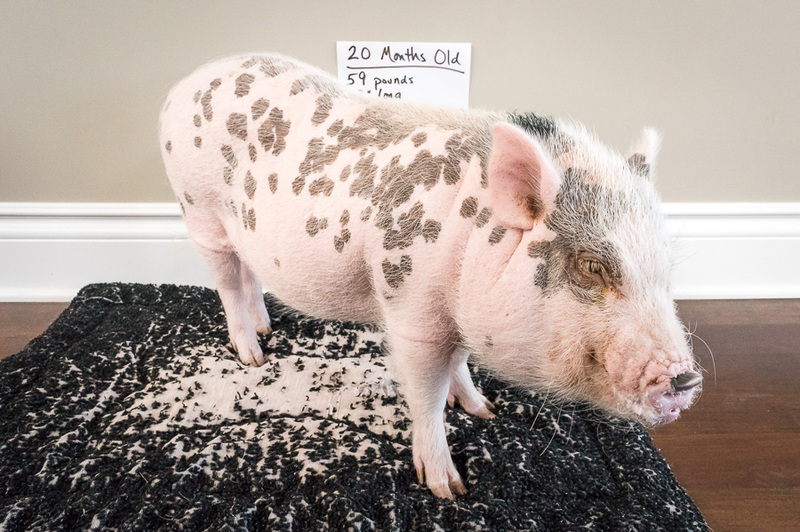 Yeah, Oscar is definitely growing still, but I think he’s small compared to a lot of mini pigs. We’ll see how much he keeps growing, but most I know of are around 100 pounds like Elmer. That’s interesting that Elmer doesn’t like the sides of his face touched either. I’ve had a few people contact me to tell me the same thing since writing this post, so apparently that’s pretty common. I’m working on learning when Oscar minds and when he doesn’t and am trying not to push his buttons to see if that helps with time. Oh the pig challenges are indeed challenges. Lol. We have some of the same. Just gotta move along and figure them out. A pig is definitely my favorite pet and have had and have many. Like 20 plus kitties 3 little dogs 3 lion head bunnies and now 3 mini pigs. Yes I said 3 mini pigs. What a challenge lol. They each have theor own personality. My little girl is very demanding and vocal about it. They funny thing is I just love to hear her and the other 2 which are both boys. Love love love them. We will eventually have a litter. Hopefully a small litter. Just keep plugging along and enjoy your piggy. Oh wow, three would definitely be a challenge! I think Oscar is probably most like your little girl who you describe is demanding and vocal about it. On one hand, I can’t imagine having three. On the other hand, I think it’s great when pigs have friends and enjoy their company. It’s interesting to me that each of your pigs has their own personality. 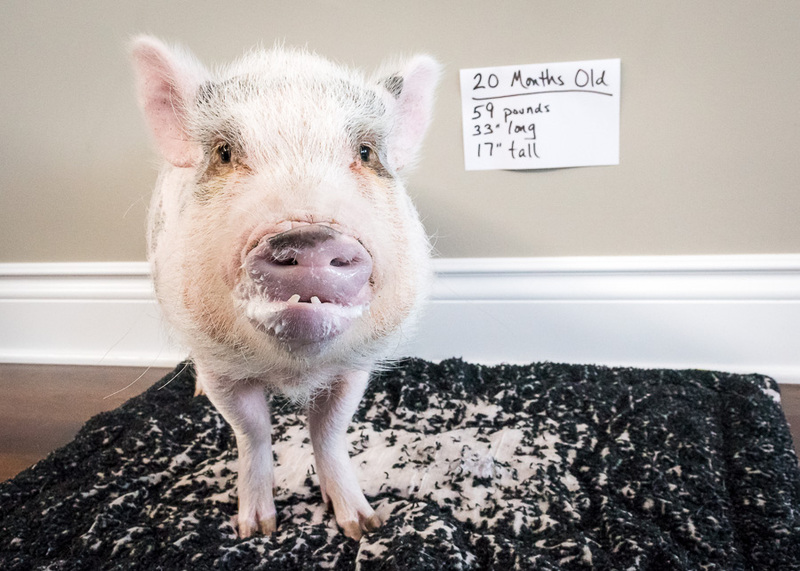 I’ve learned through this blog and from hearing from others how different the personalities of pigs can be, and I find that really fascinating. I’m almost two years in with Oscar, and I still feel like I have so much that I learn as I go. We have tons of challenges but also our share of rewarding days, and he makes us laugh every single day. 🙂 Thanks for sharing about yours and that I’m not alone with my challenges! Oscar is awesome! Glad to hear your most recent updates. My piggy Petunia will sometimes whip head and that usually includes a little biting action with it. We do have her earn any food or treats and practice move the pig a little each day. I did read that it is part of a pigs natural behavior to whip/nip a little even though I have established the leader position. The advice given was to find objects ok for the piggy to chew on (example cardboard, block of wood). Petunia loves cardboard and wood block it seems to help. I felt sad when I couldn’t lift her anymore she is already the same weight and size as Oscar but half his age! We haven’t experienced the charging at people yet – Petunia is usually wanting to hide somewhere around strangers. Wish I could get her more comfortable/social in that situation! Hi Brandi! Thanks for sharing that about Petunia! It really is helping to know I’m not the only one with a head whipping/biting pig at times. I love the advice to find things for them to chew on. Oscar does like chewing on cardboard, and I’m curious what he would do with a wood block. I bet he would enjoy chewing on it. Thanks for sharing that advice and that it seems to help Petunia! It is a sad feeling when you can’t lift them anymore. Fortunately, Oscar still gets up on the couch just fine and I can cuddle with him, so that helps. It’s more just an inconvenience trying to get him in the car or move him around when he’s being stubborn, but I’m adjusting to that with time. I’m glad you haven’t experienced the charging yet with Petunia! That has been a new one for us, although I knew it was something others deal with. Oscar was always shy around strangers, like it sounds Petunia is, and then eventually came out of his shell more around a year old. For a while, he was great with guests, greeting them and super friendly. Then, we had contractors in and out of our house for a few weeks which threw Oscar’s schedule off, and I’m guessing he finally got tired of it. By the end of those few weeks, Oscar had started charging at them and now he does it even with family. I think Petunia will likely come out of her shell more as she gets older, and hopefully you never get to the charging point. Thanks so much for sharing about Petunia! I love hearing from other piggy parents! My Renly has recently started charging at my much larger dog and nipping him on the backside. Max doesn’t do anything back to him, he just get away as fast as he can. Any suggestions? Hi Stephanie! I’m hesitant to give much advice in this area because Oscar and our dog still don’t get along. I have to constantly watch them since they both pick “fights” with each other. What I have tried to do is to let them work it out as much as possible, although that doesn’t work for me now that Oscar is much bigger than our dog so I intervene most of the time now. From what I’ve read, as long as Max isn’t reacting and Renly isn’t hurting Max, I would watch them very closely but let them work it out. I think things will settle once Renly figures out the hierarchy. But, I’m very cautious to say that with Max being much larger because disastrous results can happen between dogs and pigs in seconds. So, I would never leave them alone together and always keep an eye on them even when you’re with them. 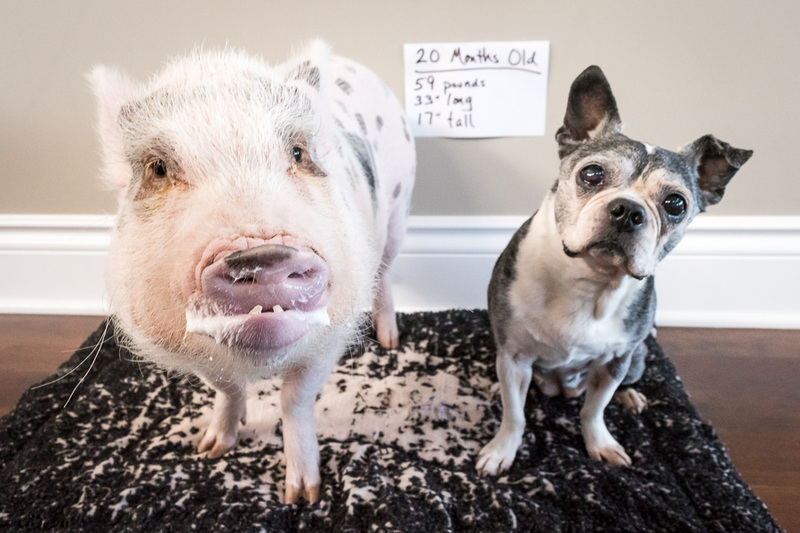 What generally happens is the pig will start a fight but the dog will win because the pig just doesn’t have as many defenses. So, it really comes down to knowing your pets and how Max is handling the situation. If you continue to have trouble, you might check out the “Mini Pig Education” group on Facebook to see what the pig owners on there say. I haven’t quite figured this out myself, so hopefully someone on there can give more solid advice! Regarding hoof trimming, we have been doing this annually with Lewis (which is sufficient) when he has his vet checkup. He has been sedated each time because we have his teeth done at the same time. In my opinion, It would be impossible to do these things without sedation. During these visits, our doctor also trims his dew claws, those little protrusions behind each hoof that help them grab onto things for balance. One thing I have noticed about sedation is that when pigs first come to, they have no idea who they are and they definitely don’t act themselves for a few hours. They don’t even recognize their pig parents during this time! We learned this when he was a piglet. You have to give them time to get their bearings as they come out of sedation so we always bring Lewis’s crate with him to his vet visits and after all the treatments, he is given ample time to recover. When we pick him up later in the day, he always recognizes us and although tired from having gone through it all, he is just fine. 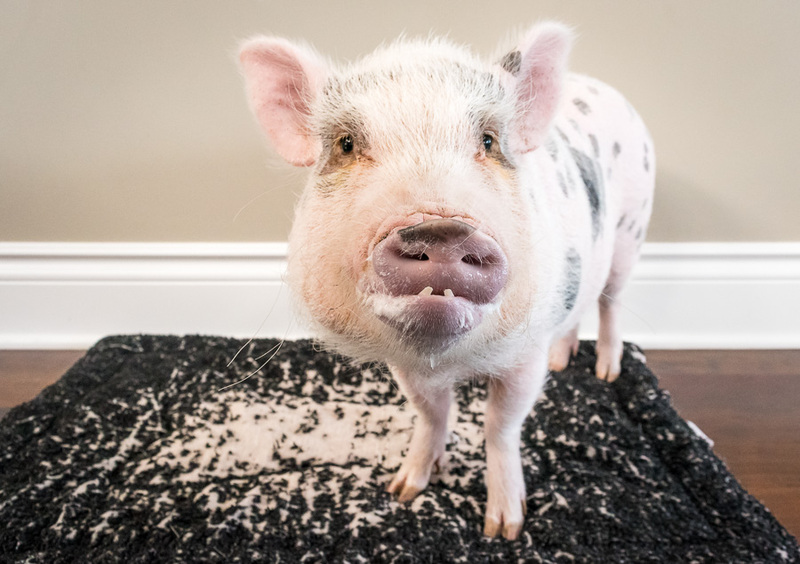 From reading the various blogs on the website, I seem to have the eldest pig of the ones being discussed so I feel like an experienced owner. The negatives mentioned in these posts are all but gone for Lewis and he just turned 4 yesterday so have hope for your little ones as you go through your paces with them. A lot happens as they grow towards maturity (potty accidents, territorial issues, making lots of noise, head whipping, etc.) but with patience and working with your little one, the rewards will come. If anyone has any questions, I am happy to answer them! Thanks Dean. There is a vet in my area who does house calls. She is knowledgeable about pigs so I trust that the sedation she would use is safe for pigs. I’m just being paranoid. She said she uses a sedative called BAM, which contains no ketamine. It consists of butorphanol tartrate, azaperone tartrate and medetomidine hydrochloride. And then the reversal which I’m not sure what that consists of. What does your vet use? Thanks again for sharing this information! 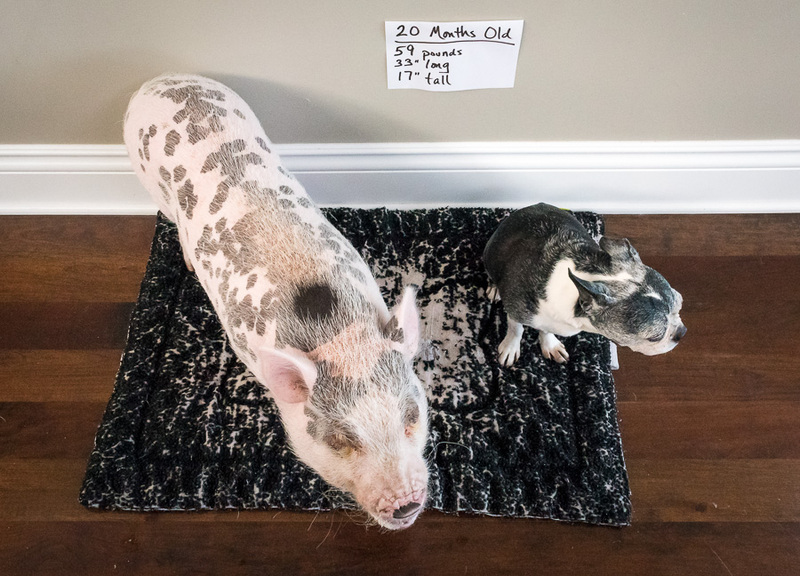 This is so helpful, and I love hearing from someone who is farther down the mini pig ownership path than I am. I feel like we are all in this together and learning as we go. I am just an owner learning like everyone else, so I much prefer this site feeling like a community in the comments where owners are helping each other. It’s good to hear you’ve been through sedation with Lewis and seem to feel comfortable with it at this point. We haven’t had to sedate Oscar yet since he came to us neutered, so it’s one part of pig ownership I’m terrified of. I’ve heard all kinds of terrifying stories about pigs not coming out of anesthesia, so it’s nice to hear the other side. I’m also relieved again to hear how nicely you’ve settled with Lewis. We have what feels like good weeks and bad weeks these days, but hopefully we’re getting to more good than bad with time. Some of it is also me just learning how to cope with his behavior changes and learning to be a more effective pig parent. We definitely do experience many of the rewards though, and that makes the tougher times easier to deal with. Thanks for helping answer questions and for sharing your experiences with Lewis! Elmer wasn’t neutered when I got him. He was put under isoflurane gas anesthetic, which is preferred over sedation, as injectable anesthetics and sedatives can be harmful to them. My girl is about 6 months older than oscar. I have a lot of similar issue’s with her. She has been charing guests for over a year. She snippy and has good and bad days. We have two pigs the boy I’m not having issues with. My girl, honestly, just doesn’t seem as happy. We also have dogs and they are separated during the day. Let me know if anything starts to work with you on agreession. We have tried several techniques and so far no go.